Are you familiar with the came called "Ninjump" on Facebook? Well, if you are, MaiRie Étoile and BryWIJ Étoile is going to have a competition with this game! -We are going to play Ninjump through our iPads. -We should only use 1 finger on tapping. So we`re counting for your supports and our poll starts now! Thank You! And the most exiting part was our last dance! We danced there with our partners and the song was played by Étoile band leading by White Étoile's elder sister, Ayame Étoile with her drummer, Yamamoto85 and DJ Subby, the pianist! Their songs were really good! Sexquisite Étoile's family was there too! Well, only his wife, Blondy Étoile and their son, Toast Étoile were the only ones who were able to attend. Vegemite Étoile and Rawr Étoile, their daughthers weren't there. But I'm so happy to see some Mia's friend was there too! ♠Oi♠BryceLoski, Cookieee. and MaRie's friend, MarDollixious♡, ƒøяτυиε¢øøќιε. and Nargacuga Nyo~, Jean Royal É assistant. And most were our old friends were there as well! ♫R&D Rina♫ , ^Rina Cutie^, ♫ Rina_Joan ♫ and Venus Baby. And alsoour special friends, Victoriaaa. ♥, ♥♫♥HønnÊý ♥♫♥. Matt, an Étoile before was their too together with Lady Doki! And! My daughter! Anna Étoile together with Nik Étoile. Well, they both rarely online but the won't going to miss the special event! Well, my first-ever-prom with my first-ever-prom-date and my first-ever-prom-dance was great! I danced there together with Bry while the girl's band there were performing and theyr band were good! Bry was good in too dancing! Can you believe it? He raised me up XD And yeah, it was sooo good! I hope my next-year's-prom with my next year's-prom-date is good too! I can't wait for it! 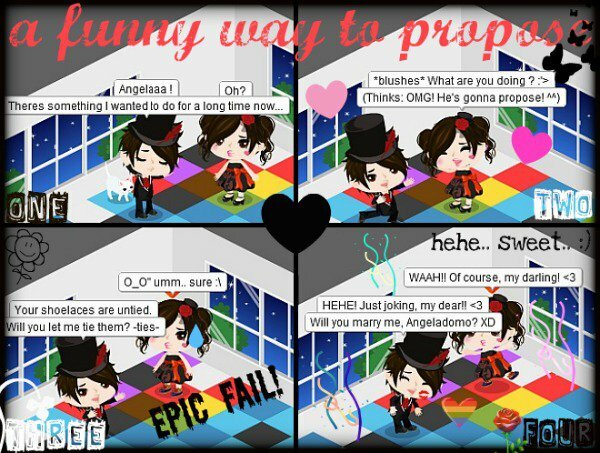 I remember the Ameba Pico Prom 2010. Yeah, it was last year. I always went there alone. No Prom date. BUT THIS YEAR IS DIFFERENT! I went together with my twinnie, Miari and I'm happy because she's always with me. We always stay there in Prom Hall and dance together with everyone. AND! We also saw Happy Oliver around and danced together with him last May, 1 2010 at Path to Prom1. I got a prom date! Neko-Reborn-É to go to the prom and we danced there in the middle. It was really fun! I hope I went there together with my sis and her date~ Yeah! Double date.. but she had in on different day so yeah.. she wasn't around! And I think it's better if it is double date. Haha! After the one week contest prepared by Étoiles. We're proudly to announce the winners for our contest! I know that the contest only has a short time and most of you were about to pass your own entries but you didn't made it on time. It's really fine for us if you're going to post your pictures event the event has been ended. I also would like to thank the 35 people who joined the contest! 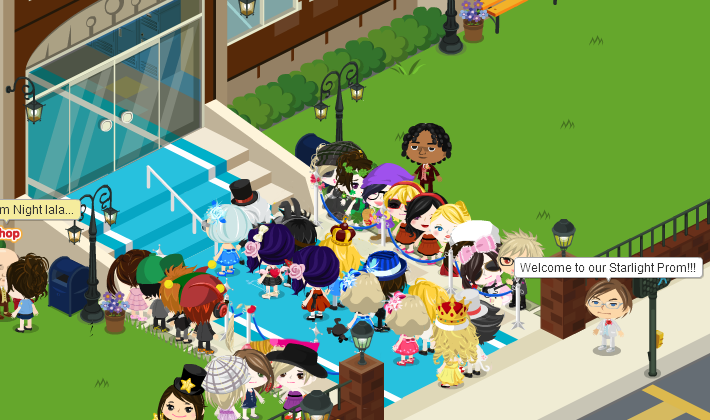 We're counting for your participation for our next Étoile Event, so... stay tune! Like Bands? Music? Rock? Well, let me introduce to you the awesome Rock band! 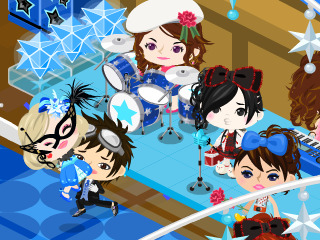 There was a popular rock band in Pico world but their true identity is hidden. There was a time, White and his band was at the cafe to promote their band when he saw his crush, Yellow. That time, White confessed to Yellow but he got rejected. He always try his best just to get her heart but he can't. They kept on inviting people and advertising their band until they became popular and Yellow started to notice White. Until Ayame invited her to attend their Live Concert. Watch the video and see what will happen with White and Yellow in the end! Have you ever heard with this Pico user? Well, maybe you do! She was on my previous post about Happy Oliver. ~rinkagamine~ was a Winner of Happy Oliver Campaign around June 2010. And today, I recieved a message from her with her new name! I was really happy and she made me surprised because I never expected that I'm going to receive a message from one of the previous Happy Oliver Winner. And I really wanted to meet her! Today's schedule was hectic. Well, I was busy in school and of course, I can't live for a day w/o opening my pico. So, when Mia and I went at Path to Prom 1, where we are scheduled to AFK our picos. And when we were about to go, Happy Oliver suddenly appeared near us and I was really nervous! There are so many Picos who are wondering who is Happy Oliver. Do you want to know more about Him? Well let me tell you EVERYTHING! Happy Oliver is a Special Pico Fairy who appears rarely in Pico World. He has a clover on top of his head and he usually wears a green shirt with a four clover leaf design and a green pants. He also has a four leaf clover painting on his face and h holds a four leaf clover. Happy Oliver is a party boy and he love to dance! Like the other people thinks, Happy Oliver is NOT a computerized Pico, just like in quest that when you dance like 10 people, he will appear. Those rumors are not true. He visits the designated places of the campaign and visit the servers. But it doesn't mean that h will visit all servers of the campaign because imagine that if there are 100 servers of the campaign, he cant visit all of those servers because it's too many and you should remember that he is not a COMPUTER but he must be controlled by a Cyber Agent/ Ameba Pico Staff or the Game Master. Happy Oliver rarely walks but instead he teleports. There are times that he's hard to catch and you should have to click and props him fast as soon as you see him before he dis appear. He also talk to us, like greetings but he doesn't really chat. His campaign is usually held every 1 to 3 months -depends on the new updates and events and based on our observation- and choose the lucky winners and give 1000 Ameba Gold to them. The very first Happy Oliver campaign was held last May 20, 2010 at the parks for 1 week. And the VERY first lucky winner was Sydney Cohen. May 20- [PARK] Win AmebaGold! Happy Oliver Campaign! June 11, 18, 28 - [PROM 2010] Every Friday's Special Event! August 9, 10, 11 - [PARK] Happy Oliver Campaign in Matsuri Area!! September 28-30 - [CASINO] Happy Oliver in the Casino Area!!! November 24-26 - [PARK] Props Happy Oliver and Win AG!!! 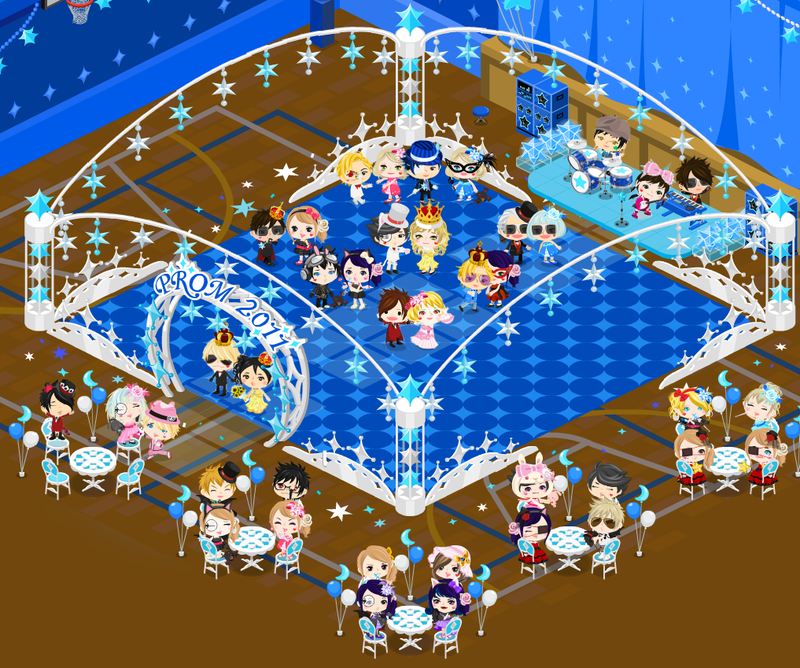 February 23-25 - [1st Anniv. Event] Happy Oliver Campaign!! 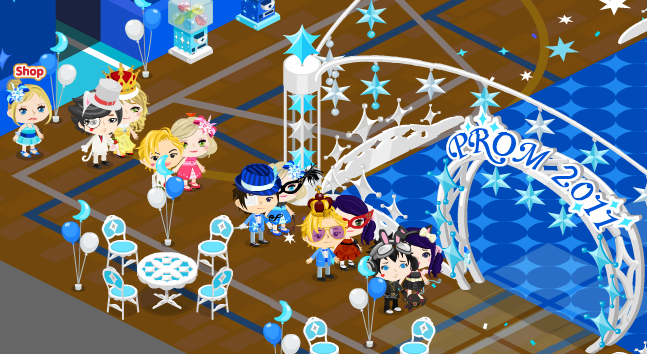 May 18-20 - [Event] 5/18~20 Prom Oliver Campaign!! July 27-29 - [Event] Meet Happy Oliver in Space! September 28-29 - [EVENT] 9/28~9/29 Oliver Campaign!! March 06-07 - [EVENT] 3/6~3/7 Oliver Campaign!! We would like to congratulate the lucky winners of Happy Oliver Campaign at the prom! They found Happy Oliver and received 1000 Ameba Gold! Just got new update from Chloe! Get a prom dresses w/o using your real money! But instead, play casino and earn and enjoy the Prom 2011 for two weeks! 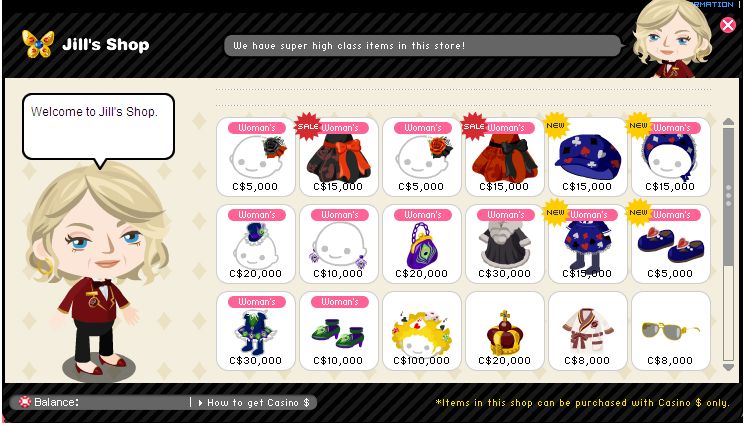 Dresses and Suits are on 25% discount in Casino Jill’s Shop!!! use the lucky stones in each area to get as many Casino Dollars as you can!! 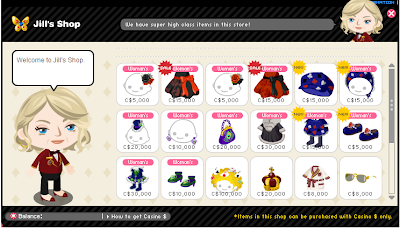 As you can see, the prom dresses and suits are very expensive than the other casino outfits specially more expensive than Bourgeois Peacock Design Dress which cost C$30,000(Dress only) and C$90,000 for it's set(dress, shoes, bag, hat and earings). And as I remember, it's original prize isn't C$200,000 when I bought it long time ago. Well, the prize here is wrong and the post has a correction if you check Jill's shop and compare the prizes. So I hope you don't get confuse with the prizes! 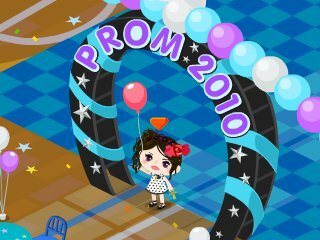 Good Luck on earning and let's enjoy the prom 2011!